If you want your orchid flowers to be presented perfectly, you will need some flower spike clips. These are a spring loaded butterfly type clip that are designed to secure flower spikes to stakes. 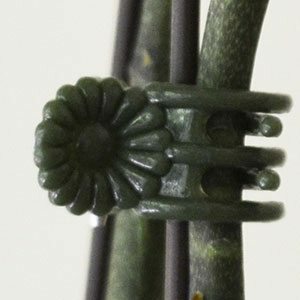 Why you need to use flower spike clips. 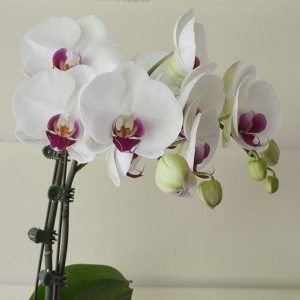 Popular indoor orchids such a Phalaenopsis Orchids, put out flower spike that can become top heavy. If you do not stake and clip them they can end up hanging down over the side of the pot. Staking the flower spikes and using easy to adjust clips is the best way to hold those magnificent flower spikes erect. You will need some thin stakes, often bamboo and flower clips. Flower spikes are best staked when they are around 8 inches (20 cm) in height. By allowing them to grow thus tall before staking they will be stronger. You can see the positioning of the clips in the image pictured right. Place the bamboo stake firmly in the pot, trying not to damage the roots. Push it is a deeply as you can..
Gently secure the flower spike to the bamboo stake. Do this low down just above the first node in the stem. Do not force the stem towards the bamboo. Bending the stem to much can cause it to break. Place another clip further up the stem. As the stem grows you may need an additional 1 or 2 clips. The top clip should be about 2 inches (5 cm) below the first flower bud. You may need to move the top clip, or add additional clips as the orchid throws out more buds.